Today is #GivingTuesday—a global day dedicated to giving back to your favorite nonprofits and causes. #GivingTuesdaykicks off the Oregon Folklife Network’s year-end fundraising campaign. 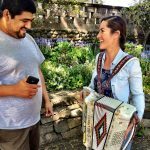 To participate: Make an end-of-the-year tax-deductible gift to the Oregon Folklife Network Fund. 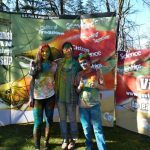 Be a part of OFN’s ongoing story from Culture Fest to our Traditional Arts Apprenticeship Program. Our programs showcase exemplary culture keepers in Oregon’s communities and Tribes. Create exhibits and public programs that highlight saddle makers, traditional musicians, fisherpoets, and more. When you donate today you’ll be joining thousands of other Oregonians in a statewide celebration of #GivingTuesday as part of the NonProfit Association of Oregon’s #CareLikeAnOregonian campaign. OFN connects! From culture keepers in Tribes and communities, to local and statewide programs and agencies, we make Oregon’s traditional arts thrive. To continue this work, we need your help. We hope you’ll be a part of our efforts to nurture Oregon’s diverse cultural heritage. Returning to work after attending the Middle Oregon Treaty of 1855 Conference, I am newly aware that I am returning to America after visiting the Warm Springs Nation. This sovereign nation that pre-existed the establishment of the United States, holds inherent rights to their lands – including access to millions of acres ceded to the US through the Treaty for usual and customary practices like hunting and gathering. These rights are not only acknowledged, but protected by the Treaty, a nation-to-nation agreement with the same legally and ethically binding strength and significance as other international treaties. The original document resides in a climate-controlled vault in the National Archives in Washington DC, however it was temporarily on display at the Museum at Warm Springs through Nov 3, 2018. This unique access to the Treaty paralleled the Museum’s celebration of its 25th Anniversary, and spurred tribal leadership to coordinate the Treaty Conference. 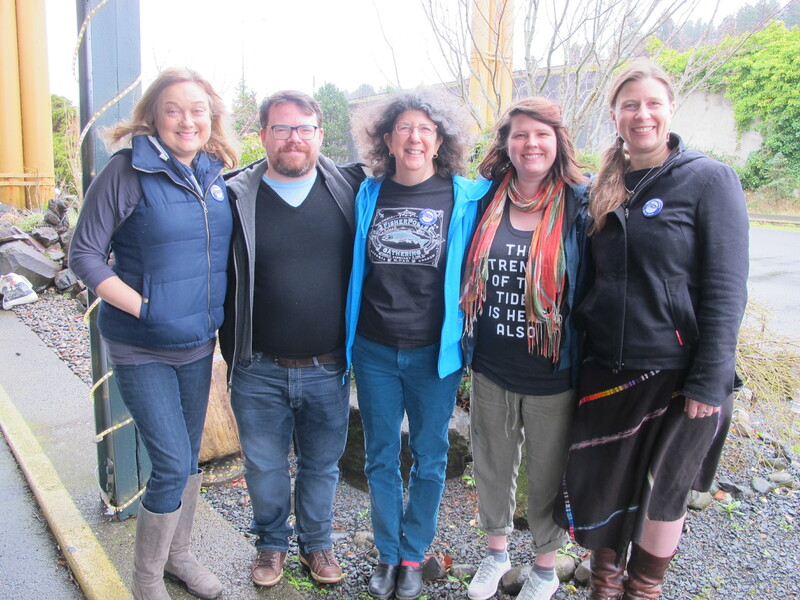 Many Native and non-native allies came together to better understand the historical context that established the Treaty; to reflect on the growth and development of tribal governance despite the overwhelming loss of language, cultural practices, lands and people; and to imagine and plan for a future beyond surviving, but one of thriving. 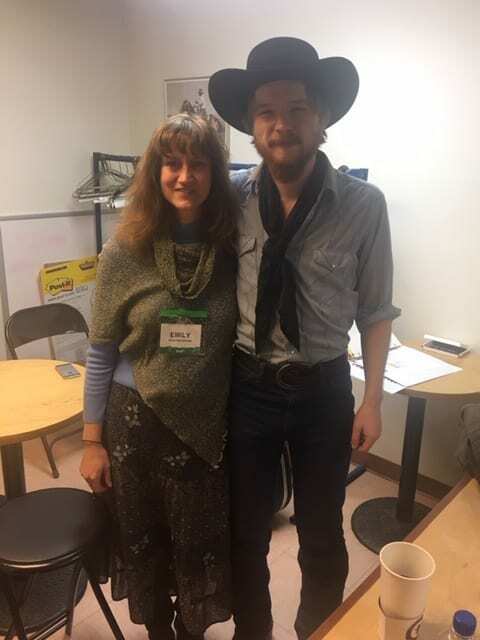 Warm Springs Tribal Council member, Valerie Switzler, invited Oregon Folklife Network to interview participants and document their reflections and reactions. Of high importance to her was engaging tribal youth in the process. OFN was honored by the invitation and donated our time in sponsorship of the event. With the help of superintendent Ken Parshall, we reached out to Fieldschool alumni, and Warm Springs sophomores Dylan Heath, Taya Holiday, and Kathryce Danzuka attended on Friday and took leadership roles in running the video camera, asking thoughtful questions, and ensuring that release forms were properly filled and returned. They showed great respect and professionalism, though I was delighted to see them relax into some light-hearted teenager fun after their work was through. 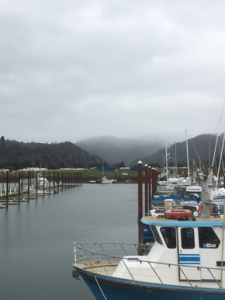 Interviews spanned a variety of perspectives, from Native American Rights Fund lawyer (and former UO Duck) Charles Wilkinson, to elder and language teacher Arlita Rhoan. Incoming Executive Director of the Museum at Warm Springs (and former Poet Laureate) Elizabeth Woody, who expertly coordinated this important event, also provided her reflections for this record, all of which is going back to the Tribal Archives. Their thoughts co-mingle with my own reflections as the days between me and the event grow. I yearn for more time to steep in my feelings and better understand and act on my sense of urgency to respond. But I am back in America now. The prayer songs fade in my ears, but for the people of the Confederated Tribes of Warm Springs, and the 500+ sovereign nations who permit US activities on the land that has been theirs since time immemorial, those songs resound often and strong. 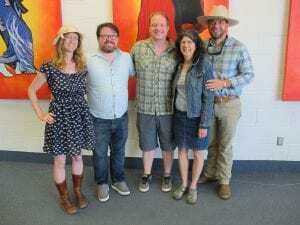 from left: Emily West Hartlerode, Bradford McMullen, Josh Chrysler, Riki Saltzman, and Steven Hatcher festival hosting, 4Rivers Cultural Center, June 23, 2018. 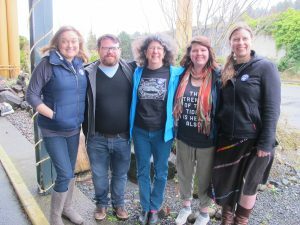 I had a busy winter and spring as the contract staff folklorist for the Four Rivers Cultural Center in Ontario, Oregon. 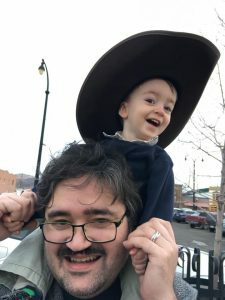 Through funding from the National Endowment for the Arts, I have been able to continue my work to develop programs celebrating and supporting folklife and traditional culture in eastern Oregon. This past year, I developed both an exhibit on regional folklife and a day-long folklife festival. 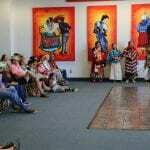 The exhibit, Buckaroo and Ranching Folklife of the Four Rivers Region, features traditional arts and skills associated with buckaroos and the ranching world. Crafts such as silversmithing, rawhide braiding, and saddle making each have qualities specific to this corner of the world. This exhibit was based on my own fieldwork, previous OFN fieldwork, and a smaller Buckaroo exhibit that Adrienne Decker developed during her Summer Folklife Fellowship at OFN. At this writing, the exhibit is on view at the Four Rivers Cultural Center. In the future, Four Rivers plans to travel the exhibit to other local and regional museums, libraries, and schools. all of whom helped facilitate the event—400-500 visitors interacted with and learned from community members and neighbors who practice traditional arts and skills. Fortunately, we have secured funding from the NEA to continue this project, and planning for a Tradition Keepers Folklife Festival (Saturday, June 29, 2019) is underway. I am heading back to eastern Oregon to continue fieldwork and to identify additional traditional artists to feature at next year’s Festival. Stay tuned for more information as this project continues to develop! 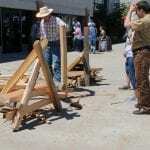 Pat Dougherty (Enterprise, OR) demonstrates rock jack building at the Tradition Keepers Folklife Festival, June 23, 2018. 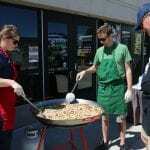 Elise Overgaard and Johnny Boyd (Boise, ID), supervised by Elise’s father, prepare traditional Basque Paella at the Tradition Keepers Folklife Festival, June 23, 2018. 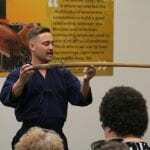 Fourth-generation Japanese-American Ryan Atagi (Nyssa, OR) explains the Japanese martial art of Kendo. Members of the Burns Paiute tribe perform dances at the Tradition Keepers Folklife Festival, June 23, 2018. 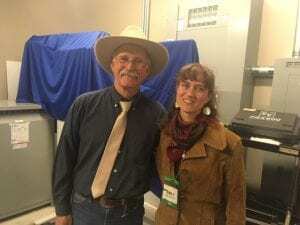 Every year, folklorists from across the western states reunite at the National Cowboy Poetry Gathering in Elko, Nevada. OFN Associate Director, Emily Hartlerode, joined colleagues to staff the festival as stage manager and host to cowboy musicians and poets Feb 1-3. 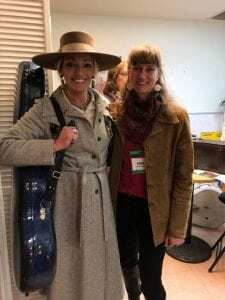 This year’s 34th annual festival theme, “Basques & Buckaroos: Herding Cultures of Basin, Range and Beyond,” made the beret, or Basque txapela, as common as the ten-gallon hat. A rich assortment of Basque music, dance, language, and rhymes came gathering from near as Elko and far as Spain’s Basque Country. 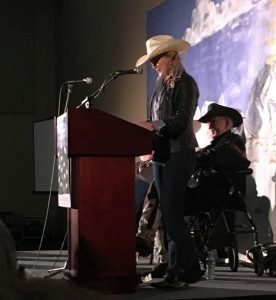 Oregonians performing at the Gathering included photographer Mary Williams Hyde (Klamath Falls), poet Annie Mackenzie (Jordan Valley), and musicians Caleb Klauder Country Band (Portland) who played the famous Saturday Night Dance. Mary Williams Hyde, whose family has been ranching in Klamath Falls since 1911, shared an hour of her photo slides in a collection called “Images of the Buckaroo: On the Ranch and in the Arena.” Her documentation of this culture specializes in the rare million+ acre ranch of the Great Basin, like Oregon’s ZX Ranch in Paisley. Annie Mackenzie was a fresh new voice in Elko, attending her first Gathering as a recipient of the Rod McQueary & Sue Wallis Scholarship. This fund, established by an anonymous donor in memory of two of the Gathering’s earliest poets, brings emerging poets, writers and reciters to the Gathering. OFN looks forward to adding to our artist roster Ms. Mackenzie, who writes thoughtful and humorist poetry of her experiences on her family’s fourth-generation ranch in southeast Oregon. Interested in performing or exhibiting at the National Cowboy Poetry Gathering? Get in touch with OFN, or watch the NCPG website where applications for 2019 will be posted soon! 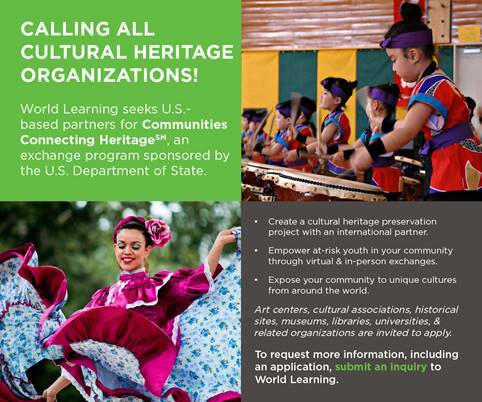 World Learning is administering an exciting initiative on behalf of the U.S. Department of State called Communities Connecting Heritage. The initiative will connect US-based organizations with like-minded organizations abroad to work on a collaborative cultural heritage project, culminating in a public exhibition and reciprocal exchange program to each other’s countries. If your organization would like to receive the application, please fill out this five-question Inquiry Form. Kindly pass this along to other individuals or organizations whom you think may have an interest in this opportunity. Thank you.